First e-reading book available now! As of today, you can buy our first e-reading book, Hop! Hop! Hop! from Amazon for £1.99. 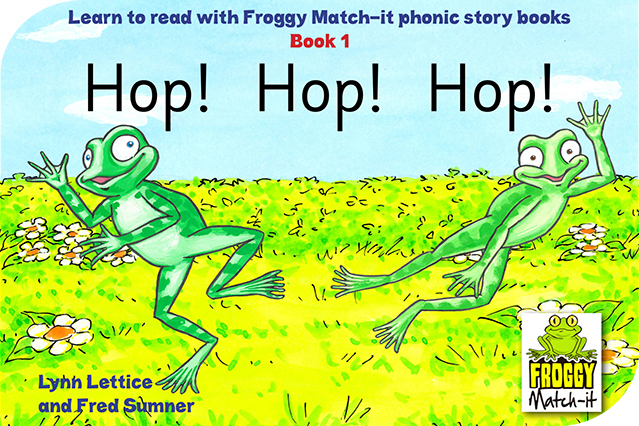 The series complements the Froggy Match-it phonic games app and features the two frogs, Fred and Fran. In this first book, Hop! Hop! Hop!, the story follows the two friends as they encounter a rather hungry cat: trouble ensues! As with the others in the series, this is a decodable e-reading book, where children can work out the words using their developing phonic knowledge. The phonics words in Hop! Hop! Hop! are the sort that are used in level 1 of the Froggy Match-it game, and in the free app, both available at the end of this month. Any child successfully using the free app, or level 1 of the main app, will be able to work out almost all of the words in the story. Hop! Hop! Hop! is a stand-alone story book and can be used by any child learning to read and spell three-letter medial short vowel words, often called c-v-c words: words such as cat, dog and pet. So if your child is learning to read with phonics and has started to learn how to work out such words, why not try this book? You will find that it is truly magical for a child to read a book to you. Buy it now for your Kindle or use the Kindle App on your tablet.